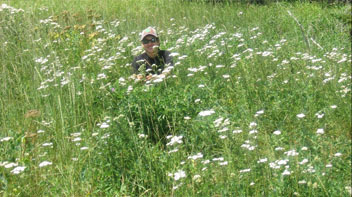 At the Guilde des Herboristes’ annual assembly last November, Yarrow was honoured as the herb of 2008 in the province of Quebec, and she went all out this past summer as a result! She flourished everywhere… in my wild garden, tucked along the bike paths and bordering lawns in these anti-herbicide times, adding interesting texture, sweet aroma and vivid colour to the entire Island of Montreal. It didn’t matter where I traveled, yarrow was always there to keep me company. In mid-July I camped on a secluded, idyllic isthmus on the Bay of Fundy in a glorious meadow of yarrow, butterflies and wild roses. Yarrow graced the sides of the highway from Quebec to Halifax and even now, at Fall Equinox, yarrow continues to grow and delight! The leaves of yarrow are what attract my attention first in the spring, fern-like and knit together in lush green laciness. I love their smell … pungent and bitter, refreshing and cool. There are thousands of tiny leaves all knit together, hence its Latin name, Achillea millefolium. This knitted appearance is an example of the Doctrine of Signatures which theorizes that the characteristics of a plant help to identify how it is used. Yarrow is a wonderful wound remedy, and is known to knit the skin back together, just as her leaves suggest. 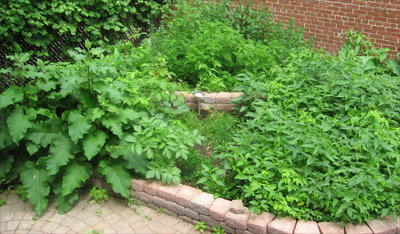 In an emergency situation, the fresh young leaves (or soft young flowers) can be used as a poultice for scrapes, cuts and gashes. 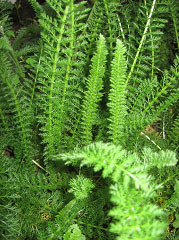 Chop the yarrow finely and pack onto the injury, then wrap it with a bandage or clean cloth. Yarrow is known to quickly repair cells and act as a cleansing astringent for deep cuts. Out of season, dried yarrow leaves can be powdered and applied directly to wounds for the same effect. The flowering tops, including the upper leaves, are harvested when the flowers are at their finest. 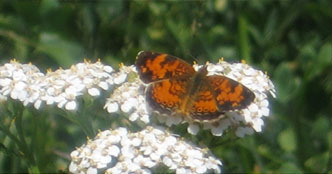 The white ones are considered to be the best medicine of all the yarrow species. They can be dried and used for tea, often taken to prevent colds and flus. Try drinking a liter or two of strong yarrow tea at the first signs of your next illness. The longer you brew it the more bitter it becomes so only infuse it for an hour or two. Yarrow shouldn’t be consumed long term so I rarely drink it for more than a week at a time. 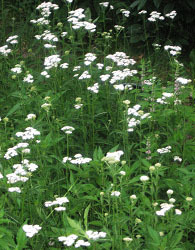 Combine yarrow with peppermint for fevers and to increase compliance! The bitter tea is also a healing remedy for your digestive, urinary and cardiovascular systems. I prefer to tincture yarrow’s flowering tops in vodka (50% alcohol if possible) which last longer term than dried yarrow and give me less to worry about when crossing borders. I keep a bottle handy in my first aid kit to use externally as an antibacterial, cleansing, styptic solution for cuts, bug bites, or tooth aches. It can also be taken internally for its pain killing, anti-inflammatory, antispasmodic qualities or to decrease heavy bleeding. Yarrow tincture is also an effective cold preventative. I take 10-20 drops twice a day mixed together in a jigger of water at the first signs of illness. A spray bottle of tincture sits in my bathroom cabinet for my boys to spritz on their acne or nicked faces. The spray feature also comes in handy when we want to repel mosquitoes as we dine on the deck, or play in the garden after dusk. When compared to DEET, yarrow tincture proved to be just as effective at preventing mosquito bites, without side effects or worry. You just have to apply it more frequently. Achillea millefolium has been studied extensively and well over a hundred active biological compounds have been identified to support what the Wise Women and Native traditions have long known. 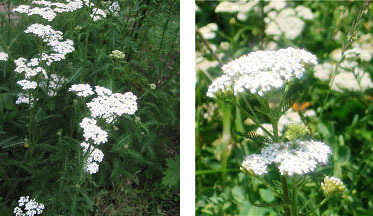 Yarrow is also edible in its early stages of growth and has been used to flavour beer and wine. Next spring, when the first signs of green return, chop the young leaves finely and add them to your salads and soups for a peppery flare and dose of vitamins and minerals, but especially to fill you with green spirit and delight! Zoom in to find Achillea hiding in my garden! Over the years I have been blessed with many inspirational teachers. I thank them for sharing their wisdom through their lectures, workshops, websites and books. For more information about Yarrow and many other healing herbs, enjoy these insightful and informative resources.